In 2010, ablative fractional laser (AFXL) was introduced as a new drug delivery-enhancement technique. 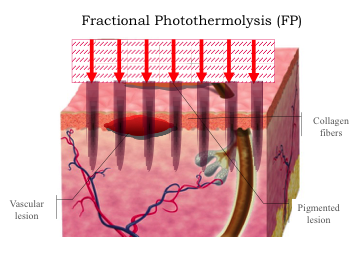 The technique is based on fractional photothermolysis, which uses focused laser beams to create an array of very small thermal injuries in the skin. Available AFXL systems include the carbon dioxide (CO2, l = 10,600 nm) and erbium-doped yttrium aluminum garnet (Er:YAG, l = 2,940 nm) lasers. These far-infrared lasers vaporize tissue efficiently, creating an array of very small channels into the skin known as microscopic ablation zones (MAZs). The MAZs cross the skin barrier, providing direct access to viable epidermis and dermis until the channels close by local wound repair, without scarring. Geometrically, the diameter, depth, and number of channels per unit skin area can be independently adjusted to regulate uptake and penetration of topical drugs. Ablative fractional laser itself is an evolving treatment modality with numerous clinical applications. 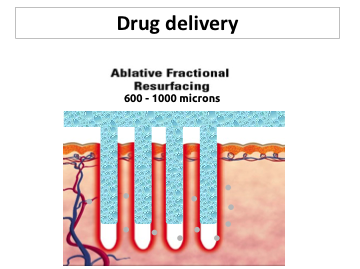 The potential of AFXL-assisted delivery is to safely enhance and control intracutaneous delivery of topically applied drugs to different layers of the skin. The therapeutic window of an AFXL treatment, that is, how long the delivery of a topical agent is effectively enforced, is debated. After laser exposure, the skin barrier is presumably broken until reepithelialization occurs (2–4 days); within hours after AFXL, tissue fluids, and granulocytes are suspected to crowd the MAZs, and to utilize the channel depth, a more rapid application is thought to be necessary. Although the depth and density of laser-induced channels can be precisely controlled, the effects of laser settings on delivery of various substances are not well understood. Although SC is the main barrier for classical topical drug delivery, the interstitial matrix consisting of collagen fibers, elastin, and hyaluronic acid can present a substantial diffusion barrier for drugs with higher molecular weights. Geometry of the channels and their coagulation zones might also affect the diffusion of drugs, in particular with higher molecular weight into the skin. Potentially, AFXL can deliver not only drugs and cells, but also particles and scaffold materials. 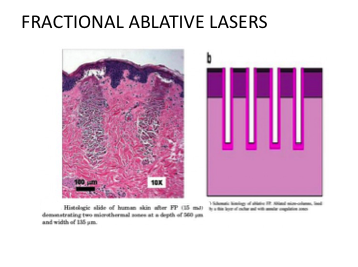 Ablative fractional laser-assisted drug delivery is a promising modality, and the technology is potentially adaptable to other organs or tissues including mucosal surfaces. 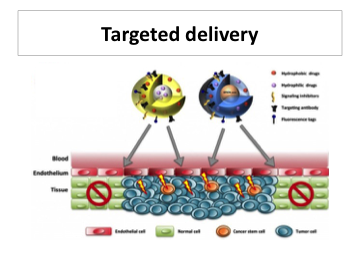 With responsible development, AFXL-assisted drug delivery may become a new important part of both medical and surgical dermatology. Prostaglandin E2 (PGE2) has been shown to have immunomodulatory effect and play an important role in melanogenesis, having growth-stimulatory effects on melanocytes and being capable of regulating their proliferation and maturation. In animal models, the topical application of PGE2 has been shown to increase melanocyte density, while lately, an observational study on humans showed significant results when a gel formulation containing PGE2 was topically applied twice daily for 6 months in subjects with stable vitiligo patches involving <5% body surface area. These positive results were also supported by evidence that UV light exerts a major part of its therapeutic efficacy in vitiligo by the increased production of PGE2. Latanoprost®, a prostaglandin F2alpha analog could stimulate melanogenesis in skin depigmentation disorders such as vitiligo. Various combination treatments have already been attempted in an effort to enhance efficacy in patients with vitiligo. It has been reported that CO2 fractional laser abrasio has an additive effect in enhancing the rate and degree of repigmentation with application of pimecrolimus by enhancing drug absorption and autoinoculation of melanocytes from the margin. Also, laser dermabrasion followed by NB-UVB in combination with a potent topical steroid increased the repigmentation rate in Vitiligo.